Paris, France, March 16, 2018 — MAX Technologies strives to always offer the best customer service worldwide. We are proud to announce the opening of our new offices in Paris, France. Our engineering center offers customer support, sales services and trainings to all customers, with a special focus to players in Europe and Asia. With three locations in Canada, USA and now Paris, France MAX Technologies reinforces its global presence. Please contact today Manel Pouget today at manel.pouget@maxt.com to learn more about the new office. We look forward to working closer with you! Montreal Area, Canada, May 26, 2017 — MAX Technologies Inc. has been providing innovative high-end avionics solutions to customers worldwide. MAX Technologies was first established in 1988 and has expended over the years, gaining market shares in USA, Europe, Canada and Asia. MAX Technologies has now appointed local distributors in China, Korea, India and Spain. Customers in these countries can take advantage of local support provided by New World Telecom www.newworldt.com in China, Testmation www.testmation.com in Korea, AdvanTRAK www.advantrak.com in India and Novatronic Sistemas www.novatronicsistemas.com in Spain. MAX Technologies and its worldwide representatives work closely together to ensure the best customer support, from sales to technical support and services. 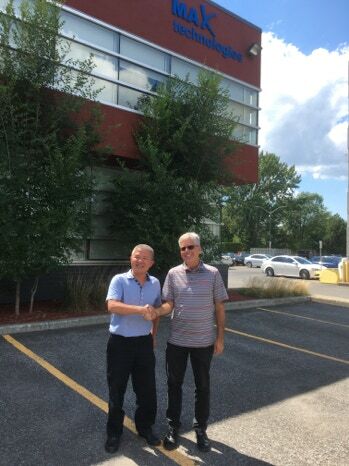 Chen Nong, CEO of New World Telecom, China and Réjean Lamy, CEO of MAX Technologies Inc.
MAX Technologies is a leading provider of avionics solutions. The expertise covers ARINC 429, ARINC 629, ARINC 664/AFDX&REG;, ARINC 825/CAN, MIL-STD-1553, ARINC 717, ARINC 708, ASYNC RS-232/422/485, CSDB, HDLC/SDLC, ASCB and Discrete I/O. From PCI and PXI cards to Ethernet StandAlone devices and portable USB boxes, MAX Technologies offers an extensive range of hardware form factors. Moreover, the software interfaces leverage the complete hardware catalog. MAX Technologies also has Engineering Centers in Clearwater, Florida, USA and Paris, France to serve the North-American and European markets.